In previous installments, we talked about the various types of pens or lofts for homing pigeons. For the dog trainer, the most significant is the flight return pen. This is a pen for your fliers that will allow the birds to fly freely outside the pen and then return. It is not unlike the pens used by those who race pigeons, but here the objective is different - you are not necessarily training the birds to return over long distances, but often from a nearby field. To many people, a "flight pen" denotes a pen big enough to fly within. These have their place, especially with captive ferals. And very important with pheasants and chuckars. Homers, however, can be flown outside the pen. Many people complain about how poorly homers flush. This is more often than not due to the fact that the birds have not been flown. It takes good exercise to build up wing strength. As an aside, many breeders also select for docile birds - culling those that fight you back with wing beats when you attempt to inspect the nest. A smart dog-training breeder will select these birds and cull the docile ones. Keep in mind that homers purchased as culls are often sick, old, or too young. You will have the opportunity to raise stronger birds than these. 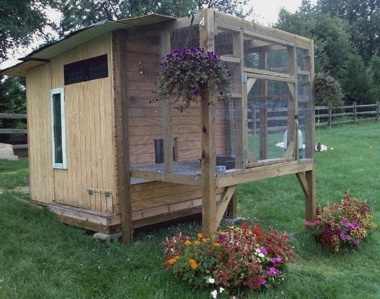 A flight pen has similar requirements to other pens, except no nesting boxes are needed or even desired. Eliminating the boxes will keep most of them from putting energy in to mating and laying eggs. Perches are good - and flat perches about an inch wide are better than round perches. Try to place the perches where the birds will not crap on food or water below, or other perches below. The most important aspect of a flight pen is a return for the birds. There are many designs out there. A sputnik is a set of bars, spaced such that the birds cannot easily fly out, but can dive back into from a landing pad in front of it. When flying from inside, the outstretched wings hit the bards. Re-entering with wings folded is easy. The sputnik is placed above the floor of the pen so bird cannot walk out, however it has a porch (landing board) on the outside so birds can walk in. Some commercial designs use walls instead of bars to make it harder to fly out. I had one bird that managed to get out consistently. By trial and error I found that a bar spacing of 3-3/8" inches worked best for MOST of my birds. I have a fold up gate with additional bars for security when I am not flying my birds- keeps the birds in and the screech owls out. 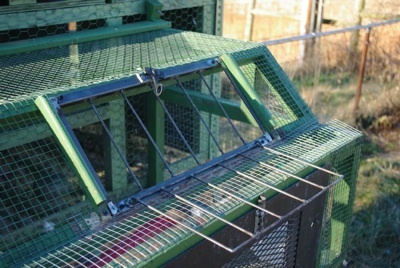 Other designs use hanging bars called bobs, much like many pigeon traps. These work best in conjunction with an aviary - basically a sun porch. If you can get the birds used to re-entering the pen from the aviary, then you can open up a slanting top on the aviary and the birds will land on the floor and walk through the bobs as usual. See this website for details. Best results in flying birds will be with birds that were raised at or near that pen. 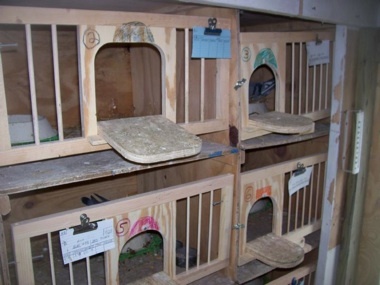 I would not fly any imported birds for at least six months - or you may be buying them again when they return to the breeder. Young birds should not be flown until about three months old- give them time to develop some strength and street-smarts. Once the birds are well conditioned to return, and have developed good muscle tone, you can start using them for flushing drills. It is somewhat amusing to train in the field behind my yard and see the birds flush and go straight to the pen. If your training location is further from the pen, you might want to start releasing the birds further and further away from home over a period of weeks until they are sufficiently trained. One side note - Homing pigeons are called homers because they have very strong homing instincts. Some pigeon breeds may have less homing instinct than a homer. You may also wish to select for stiffer feathers, which will hold up better under sharp puppy teeth. So if no-shoot flushing drills are what you're planning, and you want birds that will return, get some good sturdy homers for your foundation stock. This issue's "Coup de Jour" comes from Mac MacSweeney in the Philadelphia area. Mac not only has fast springers, he has fast pigeons: he's a pigeon racer. 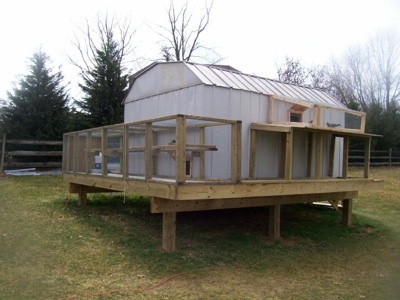 Here's a shot of one of his lofts, built around an inexpensive metal garden shed. Mac placed the shed off the ground to give it more ventilation and keep it dry. In another loft, he has nest compartments for his breeding pairs. Note the use of nesting bowls to keep the eggs from rolling away. Because his birds are pedigreed, the compartments and breeding cards help him keep track of who is who. Finally, this loft (below) shows a nice feature. Note the small door a floor level on the side of the loft. This allows for easy cleanout with no lifting - you just push the poop out the side. As you can see, Mac is not afraid to try different designs and find out what works best for him. His lofts, while not overly-expensive, and well built and fit well in his suburban neighborhood. Of course, it doesn't hurt that the Philly/NY corridor has a long established pigeon culture. Got a great coop or pen? Or a good tip? Wingtips: Propagation and Care of Pigeons for Dog Training - What to Feed? 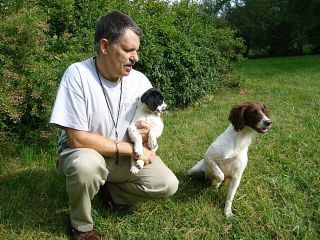 Bill Fawcett resides in the Shenandoah Valley of Virginia with his wife, Cindy, and his Smythwicks Springers: Jenna, Beebe, Pie and Drake. He is an avid hunter, field trialer, breeder and member of the M-AHSC and the ESSFTA. Bill is a regular contributor to Spaniel Journal through various articles, book reviews and his Wingtips column. Bill also maintains an extensive public ESS pedigree database at smythwicks.org.